Good morning and welcome to the October Stitching Feature! 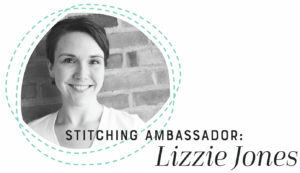 I’m Lizzie Jones, your Stitching Ambassador, and this month I’m introducing a couple of brand new stitching dies that I truly hope you’re going to love. The first is one that has been heavily requested the past several months. 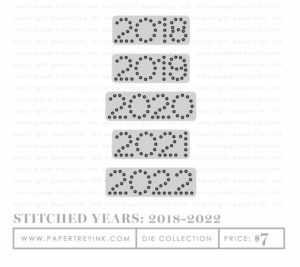 It’s the Stitched Years: 2018-2022 Die Collection and it will be available at 10pm ET, October 15th on our website. This die will make it a cinch to stitch the next several years onto your Heirloom Ornaments, coin purses, Hoopla projects, and so much more! The next new release this month (also releasing on the 15th at 10pm ET) is something I have personally wanted for a very long time. Finally it has become a reality! 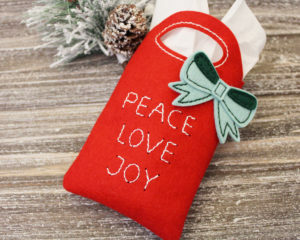 I used to work in a boutique that sold little felt bags similar to these and I always wanted to create my own. 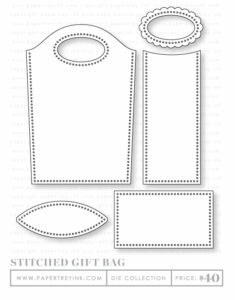 The Stitched Gift Bag Die can be used to create a pocket bag, a narrow gift bag, or a deeper gift bag all with one versatile collection! 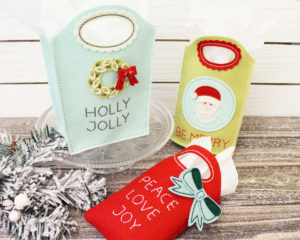 Use these bags to give gift cards, candles, jewelry, and more. 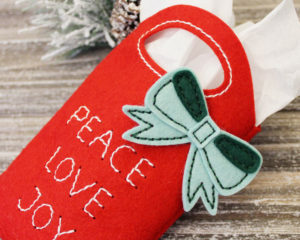 Pair it with other Seasonal Stitching dies in your collection to create a truly special keepsake that can be used again and again. 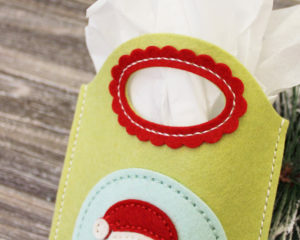 You won’t believe how much fun you have creating these fabulous little bags! I’ve made several now and I’m already thinking up new and exciting ways to use these dies that I hadn’t even considered when I designed the collection! Today I’m going to share a few of my Stitched Gift Bags. 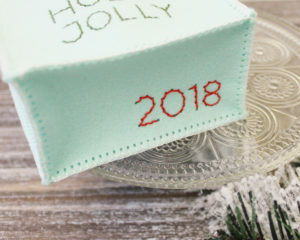 They are so easy to decorate with the Seasonal Stitching Dies, but they would also be fantastic cut from reinforced fabric or patterned felt for a simpler, quicker option. 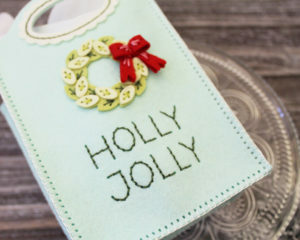 Let’s take a closer look at the Holly Jolly Bag I put together to share with you today. This is the largest of the bags I’ve made thus far. I used the wide bottom and side panels along with two of the front/back panels. The finished size of this bag is 5″W x 7″H x 2 1/2″ D.
I cut the base of the bag from Aqua Mist felt and the scalloped handle embellishment from Vintage Cream (more on that in a minute). The wreath is cut from Simply Chartreuse and Spring Moss while the bow is Pure Poppy. I decided to blanket stitch this bag to add a unique detail along the edges. 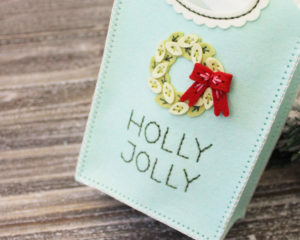 I used the Seasonal Stitching: Wreath and Stitched Holiday Words dies to embellish the front of my bag. The words die made it so easy to add a message and the wreath was so much easier to assemble than I expected. Such a pleasant surprise! I’ve always imagined these little bags being useful year after year, so I decided to use the new Stitched Years: 2018-2022 die to add a date to the bottom of this bag. My mama-in-law tends to use cute holiday bags as home decor, so I figure even if this bag doesn’t get regifted it could still find new life as a seasonal decoration. It would be nice to be able to keep track of when each bag was made. The next bag I’m going to share is this sweet little Santa number. This time I used just two of the front/back panels with the oval bottom. The sides are stitched together with a basic running stitch and the bottom is flat. The finished dimensions of this bag are 5″W x 7″H x 1 1/2″D (though it does narrow at the sides). 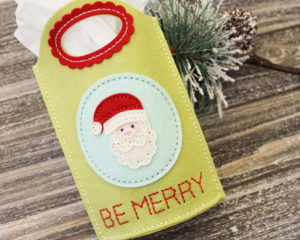 I cut the bag base from Simply Chartreuse and then used Aqua Mist, Vintage Cream, Sweet Blush, and Pure Poppy to create the Seasonal Stitching: Santa feature. I used a Stitched Circle to give his sweet face a ground and then used the same Stitched Holiday Words die to add a greeting. I used Pure Poppy felt for my scalloped handle enforcer. 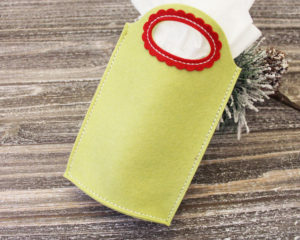 The handle has the holes built in and you can simply stitch them (to reinforce the handle) or you can add this embellishment. It not only reinforces, but it’s cute too! I also wanted to show you what a plain bag might look like (this is just the back of this bag. You certainly don’t have to embellish the bags if you don’t want to spend the time – they’re adorable either way! Can you imagine this in patterned felt or reinforced fabric with a contrasting handle?! The last bag I’m going to share today uses the front/back panels only. I sewed the right sides together using a basic running stitch along all of the edges. Then, I simply flipped the finished bag right side out when I was finished. The finished dimensions of this bag are approximately (it’s a little harder to measure because it’s poofy) 4 1/2″W x 6 3/4″H x 1″D. I cut the bag base from Pure Poppy felt and then added a Seasonal Stitching: Bow using Ocean Tides and Pinefeather felts. Again, the Stitched Holiday Words came in quite handy for the greeting. I decided to just do the basic reinforcement stitches for the handle on this bag. It’s a cleaner look and I thought the scallops might compete too much with the bow being so close. I also wanted to share another quick peek at the Stitched Years: 2018-2022 Die. 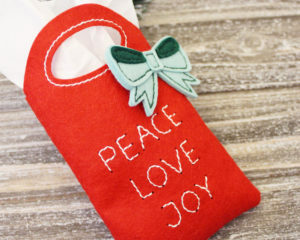 If you check in on my blog regularly, you may have seen these personalized tags I made for the kiddos in my life using the Heirloom Ornaments 2 last month. What you didn’t know was that they already had the year stitched on the back! Sneaky, sneaky! You can also see the original Heirloom Ornament there too. The “2018” die fits beautifully! Thank you so much for joining me today! I hope you’re looking forward to these new dies. Have a wonderful weekend and I’ll see you again soon! oh Lizzie, these are just adorable! I have so many ideas running wild in my head already for them! Thank you for making things so easy for us!!! Lizzie, each of your examples are just too cute. I am so happy that you are carrying on the much loved PTI dies. Have a wonderful weekend. Very cute!!! Love all the different ways you used the dies! I am head over heels in love with these bags made of felt. Just the perfect sizes too! I want to make some out of cardstock also, for those in my family who I know would not regift the bags. Thanks Lizzie! That gift bag!!!! I especially love that it is flexible so more than one size can be made 🤗. All of the projects are so inspiring. And yay, more years! Yahoo…I’ve been hoping for a “years” die. Unfortunately I’ve done so many of my decorations for this year as I have worked on them all this year but I’ll be ready for next year. Love the new gift bag dies! The fact that this set can make more than one size bag is great – more bang for the buck. Thanks, too, for the new “years” die. 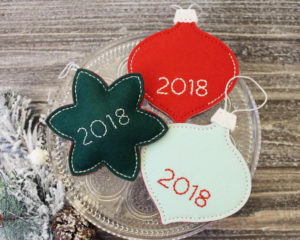 So helpful when making ornaments this year and into the future. Love the gift bags. Can’t wait to order these. I’m not much of a felt crafter, but these bags are having me rethink that! Super nice Lizzie! Love the bag! 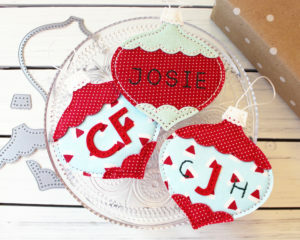 And I need the years now so I can start stitching that on the back of my ornaments! These are adorable. Can’t wait to order and get started. YAY! And thanks you Lizzie for creating the stitched year dies! I feel like a kid whose wish was answered by Santa. Hahaha! Love the new felt gift bag dies too. I like these projects! but have never made anything like these. Was wondering about how long it takes to complete the larger bag, in its simplest form? That’s a great question. I haven’t done one without all the fussy stuff yet, but I hope to get a simpler one done a little later this week. I’ll make sure to report back! I always love your felt projects & the new bags are just wonderful! Love all the options! 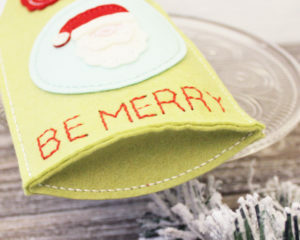 I love the stitching felt dies!!! Hope I can add these to my collection!! I’m always looking for unique gift bags. These are wonderful. Can’t wait to see more. This is taking homemade gift giving to another level. These bags are beautiful and stitching the year onto them is a magnificent touch. These will perfectly compliment the advent gift packages I’m putting together for my niece. I love the gift bag! A must have for me! The year number is a great update… keep those dies coming …love them! Thanks! Wonderful sweet gift bags!!!!! Love them all!!!!! I’m excited to decorate a bag like an Amsterdam canal house using the gingerbread house door and window dies! The bag is just the right shape. Thanks for all your new stitching dies. Please keep them coming after the holidays. Papertrey stitching dies are my very favorite art supplies! I love all of your stitching dies & am so thankful that such a variety of stitching dies are offered through PTI. Please continue to produce more in the future! Sure do love a giftie bag! These are great Lizzie! These bags are so cute! I can’t wait to make up a bunch for holiday giving. Anyone else having better luck with these? Kathy, I’ve learned that some colors are tougher to cut through than others (the Aqua Mist and True Black are particularly thick). Maybe try a different color to see if you’re having the same trouble. Also, you mentioned that you’re using a shim, but is it the metal shim? I find that the rigidity of the metal really helps. All machines are calibrated a little differently and I’ve noticed the Cuttlebug is one of the looser ones (though I use one regularly, too). You can always use the dies with reinforced fabric (iron on interfacing is great for this) since it would be thinner. And if you’re still having trouble, I would suggest contacting Customer Service to see if there’s anything they can do. I’m so sorry you’re having a difficult time. I hope one of those tips helps! I’m very grateful to you for this suggestion…I dug out my metal shim (we had a house fire in April and there are a lot of things I haven’t dug out yet) and added it to my sandwich, and it worked! I’ve got three bags cut out now, and will get stitching!